To establish a community of people to advocate and monetarily support the process of adoption. This parable speaks to what the heart of this organization is about and is part of what it was founded on. We hope it speaks to you as it has to us, enjoy! One day, a man was walking on the beach. He saw, in the distance, what looked to be a boy frantically tossing rocks into the sea. As he got closer, he saw the boy was actually throwing starfish, which littered the beach as far as the eye could see, back into the ocean. 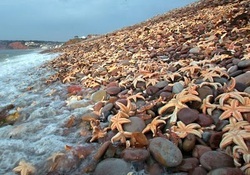 The tide had washed the starfish ashore, and now that the sun was rising in the sky, they all surely were doomed to dry up and die. The man asked the boy what he was doing. The boy replied that he was trying to get as many of the creatures as he could back into the saving coolness of the ocean.